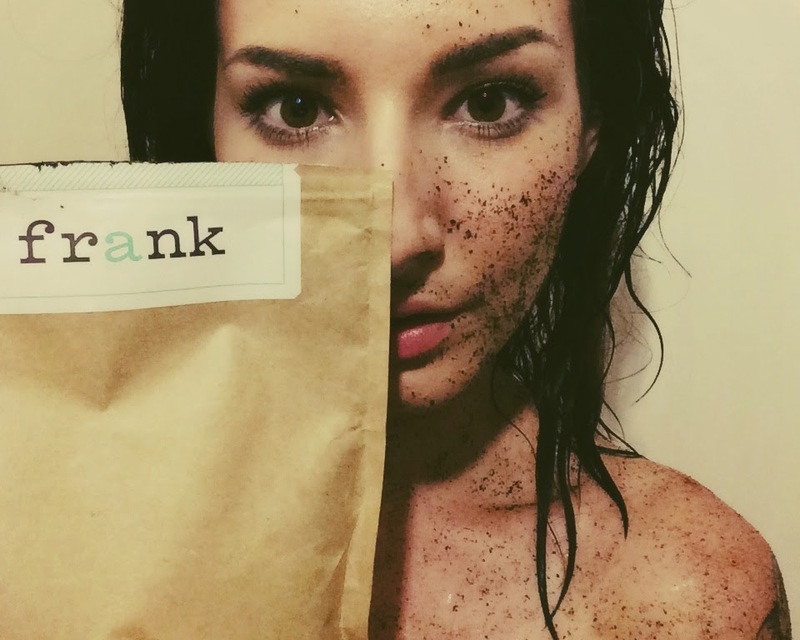 Like you probably have, I've been seeing these Frank body scrubs pop up everywhere with their risqué pictures of girls/boys covered in what looks like soil, along with cheeky little captions such as "Get Naked, Get Dirty, Get Rough, Get Clean" over social media for the past couple of months, and like most things that get a whole lotta hype.. it sparks my curiosity. 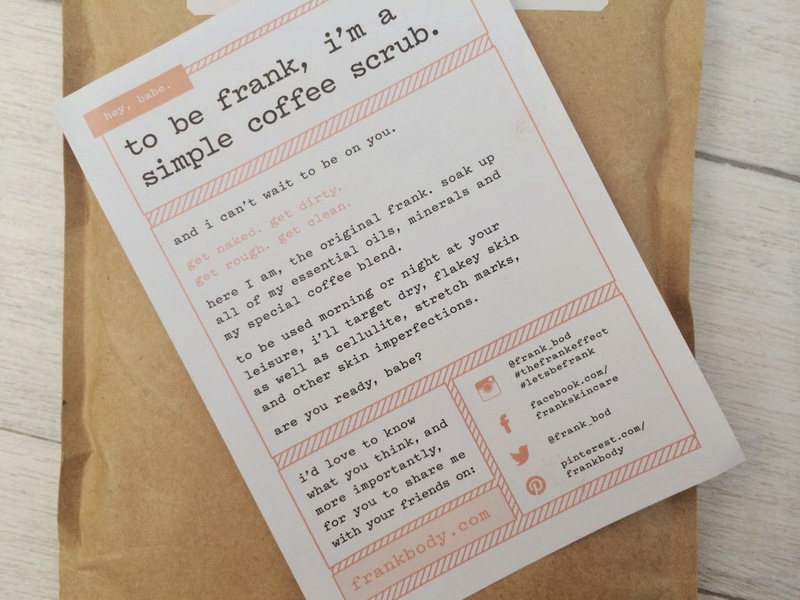 Plus I do love me a good body scrub, and Frank wasn't just your average man scrub..Frank was a fresh COFFEE scrub, and if you know me at all you'll know I'm a sucker for coffee. 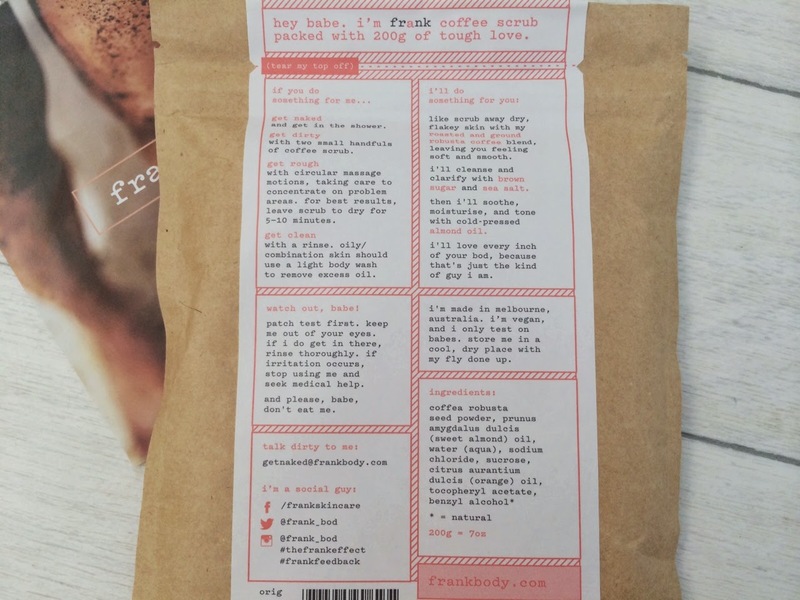 The Frank body scrubs promise to smooth, tone and moisturise your skin while helping to target cellulite, it all sounded pretty good to me, so really I had to just get them and see for myself. I popped on their website thinking I was only going to get one then I spotted they had selection; oh no I'm terrible at selection! I was ages deciding between three, Original, Coconut and Grape Seed or Cacao...I opted for Original and then thought the Coconut one sounded too yummy to pass up...sorry Cacao im coming back for ya I promise. What's brilliant is that it was free delivery for us "British Babes" (Frank seems to call everyone babe, what a sweetheart eh?) and a day after ordering its was in my grasp, here they are now.. 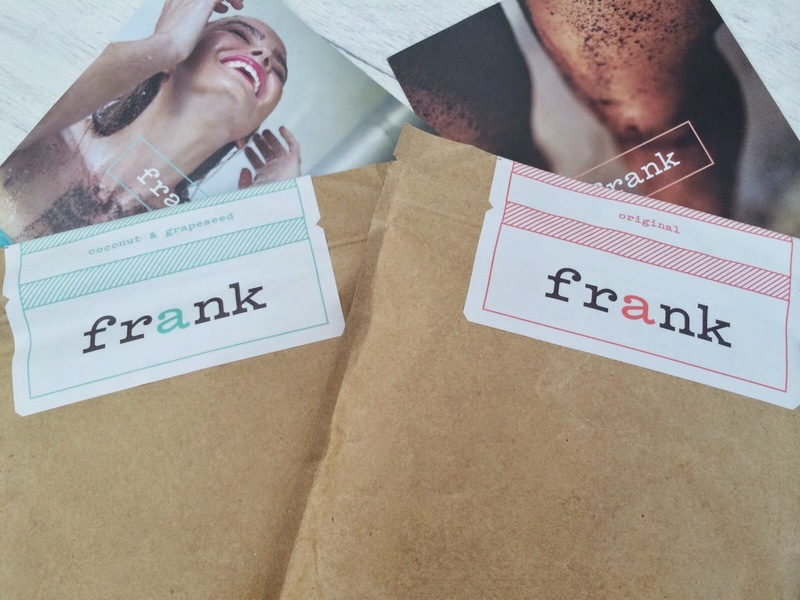 The Frank body scrubs come in what looks like brown paper envelopes, along with little leaflets that contain a bit more about what they do for your body and how to share your scrub time with your friends via social media using #thefrankeffect and #letsbefrank ..I like that one I totally see what they did there *wink wink. 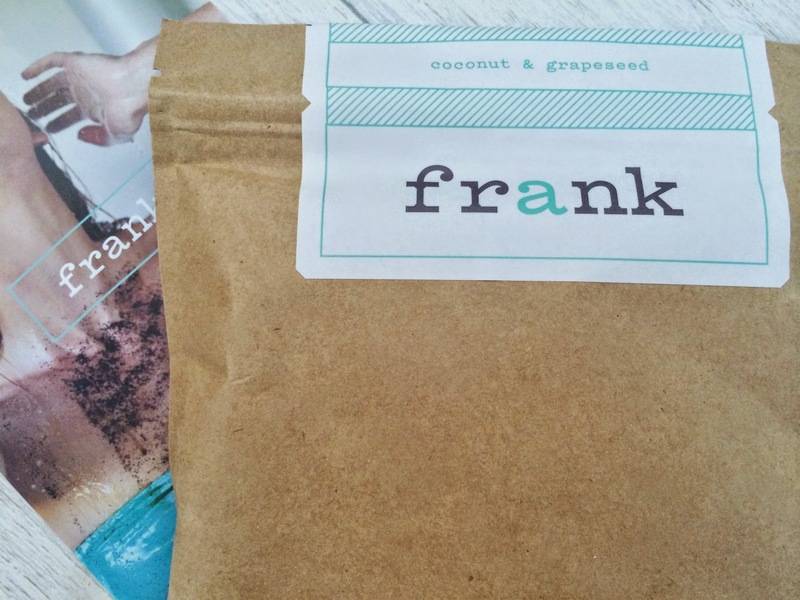 This Original body scrub's main ingredients are Coffee, Sweet Almond Oil and Orange. The Coconut and Grape Seed one.. The main ingredients for the Coconut and Grape Seed one are Coffee, Coconut and Grape Seed Oil (well that was stating the obvious want it?! ha). 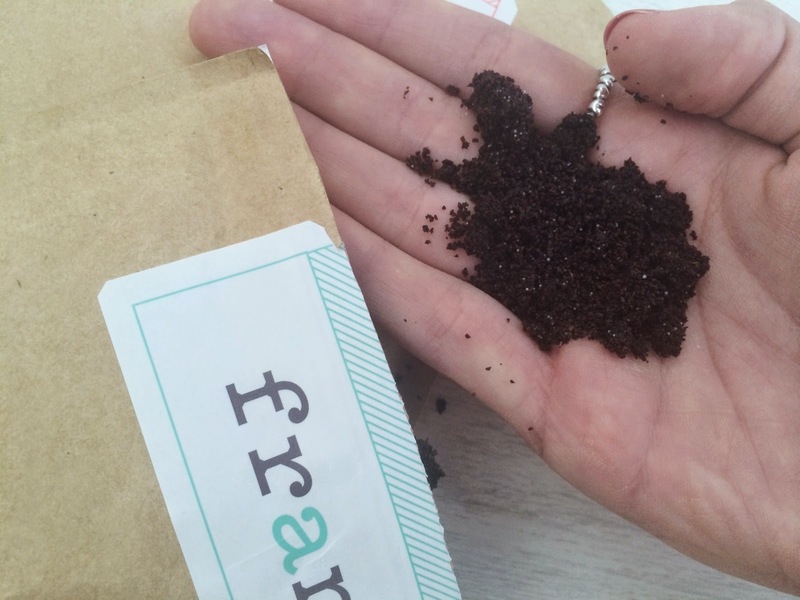 To get stuck in all you do is simply rip the top off the brown envelope or cut neatly with scissors like me, then the absolutely AMAZING aromas off coffee hit you, I must have been sat smelling this for a good 10 minutes, it smells just like fresh coffee beans. The original has a hint of orange to it and the coconut one has a hint of...you guessed it coconut. Then all I did was dampen my skin in the shower and scooped out a few small handfuls out the paper bag (don't worry..you may think the paper bag isn't a good idea to get wet but its actually plastic inside and has a seal along the top to keep Frank from escaping). As I said before it looks like actual soil, and feels almost like it too.. I then patted it onto my damp skin all over while still standing in the shower as its very messy, just turn off the water to stop you washing Frank down the plug. Then all I did was scrub away working in circular motions over my body (face if you like as well) and left it on for 10 minutes like it says to, this lets all those lovely ingredients really have time to sink into your skin for best results. While your there waiting for the scrub to sink in don't forget to take a Frank selfie.. CHEESE! I didn't quite fancy showing any more flesh than this unlike some *cough cough , I just didn't want to make the people of Instagram cry with horror you see. 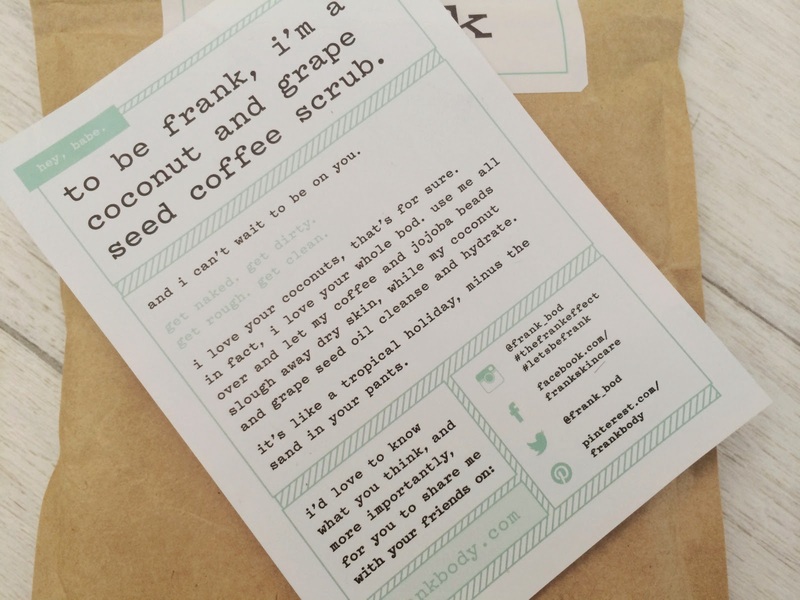 I couldn't even bring myself to caption it with "getting dirty with frank" or any other cheeky cliché that the brand have going on, so I opted for .."Frank you smell so nice" pahaha go on laugh I know you want to ;) I'm such a risk taker me!. When the 10 minutes where up I rinsed off my bod in the shower, and woah my skin was so flipping soft I could not believe it. My favourite scrub ever was Soap and Glory's The Breakfast Scrub; I guess that has a slight coffee scent to it too.. I never thought I would like something more until I met Frank. I use this Twice a week and I'm completely addicted to how great it makes my skin feel and look, as for helping with cellulite I cant really comment on that as I don't really have much but this would only be seen on continued use. When I hopped into bed that night Nick was like "Zoe you smell like you've just walked out of a coffee pot" so if your not keen on the scent of coffee or coffee itself then you will more-than-likely hate this, as its very pungent.... I how ever love it and cant get enough; so much so whenever I pop upstairs I have to open it for a quick whiff...*smells it now..ahh soo good!! 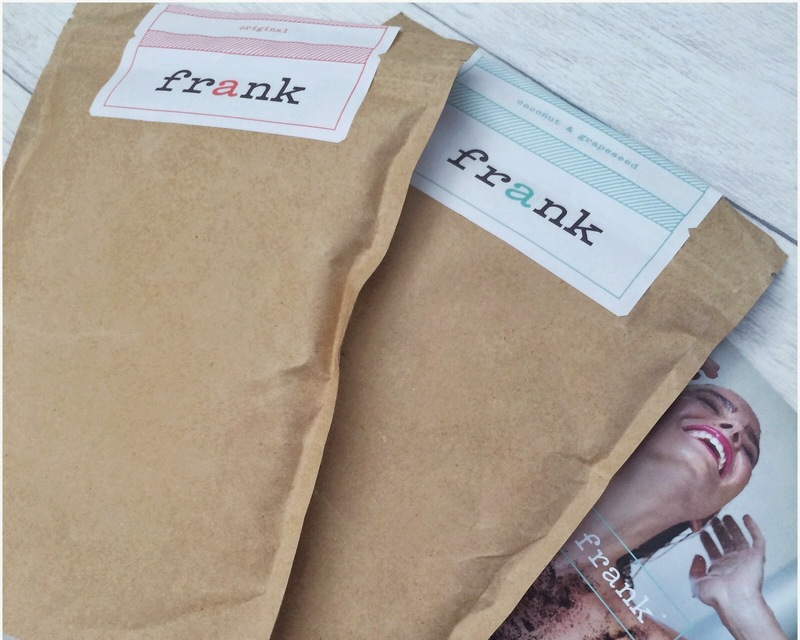 I think the price for Frank is pretty great you get 200g of product for £11.95 (original Frank), and you can buy it here with free delivery. Like I said Cacao im coming for you next! 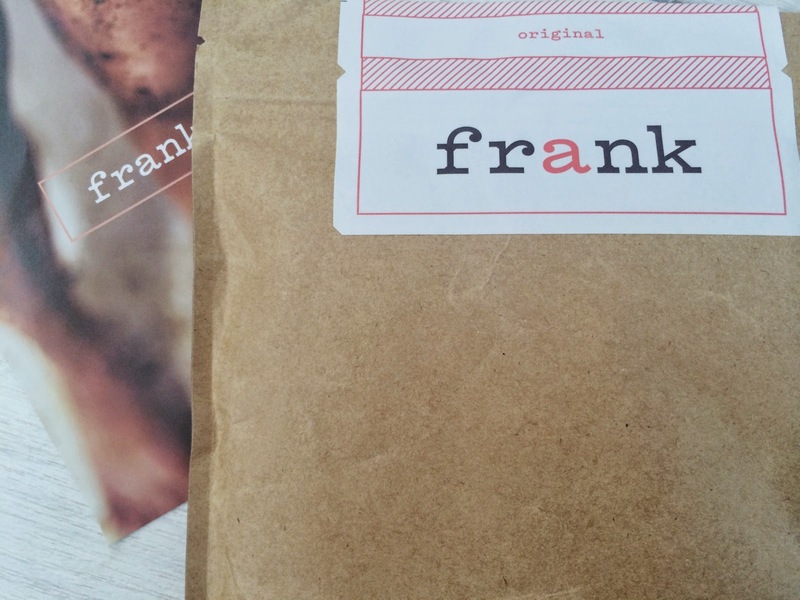 Have you Tried frank? What are your thoughts? I would love to hear from you. That last photo looks like it could be a professional model shot, you stunner!! This sounds a bit quirky and right up my street! Your last picture looks so good! Shame I don't like the smell or taste of coffee so this product probably wouldn't be for me! 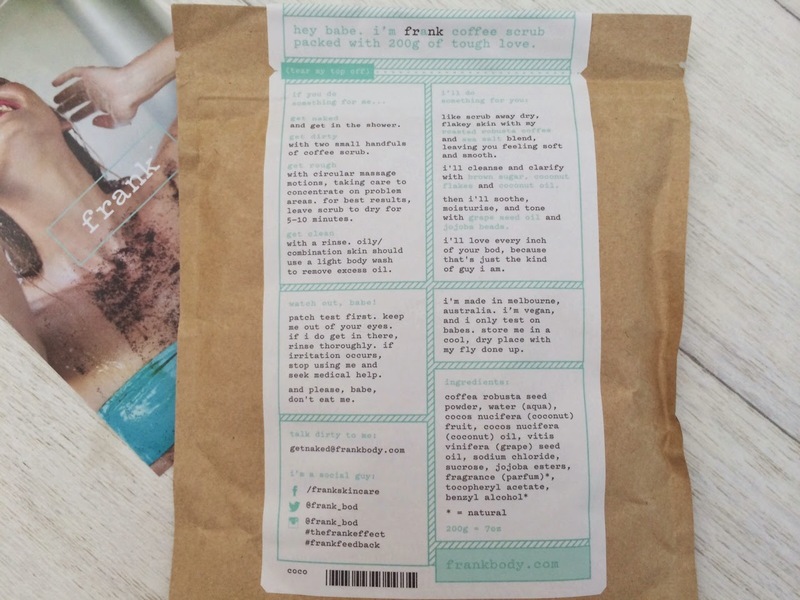 Thanks for the post, always a pleasure reading your blog. Happy bank holiday weekend! i really wanna try this and may i just say you are the prettiest thing in that selfie! ps. win raybans and beauty goodies worth £300 on my blog! click here. Ohhhhhhhh Sh*t girl do you know how pretty you are?